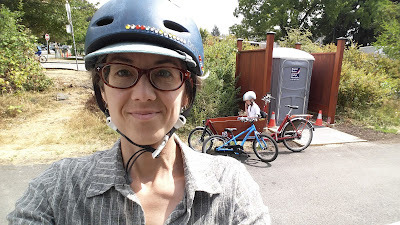 We biked along the Arbutus Greenway with the kids yesterday. It was a fairly epic ride for seven-year-old Linnaeus: he rode from our home to 45th Ave where it met the greenway, all the way down to the north end at 5th & Fir, then from Granville Island to Ontario & 5th Ave. 17km in total on his 20" single speed bike. Bronte, who's almost four, biked 8.5 km, from 45th & Arbutus to 5th & Fir, then along the seawall from Granville Island to Creekside on her teeny 12" bike. 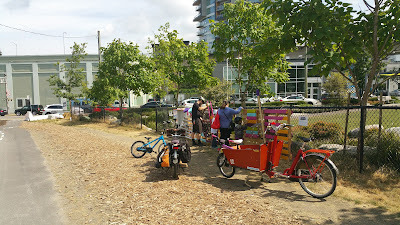 (hashtag proud mama) Because we were riding our cargo bikes, the kids were able to hop on & get a tow whenever they needed a break or the route was too hairy for them to navigate the roads. Smooth sailing! The greenway is all paved now & the asphalt (as of summer 2017) is very smooth to ride on. Railroads are flat roads. The route has fairly gentle hills, with the "peak" being around 37th Ave. Follow the lines. There is a line painted down the middle of the path & biking/walking symbols so kids can practice riding in their "lane". Skip the traffic. On weekdays it's not too busy--we didn't encounter any fast riders, & those who passed us were courteous. I find the seawall is generally busier than that. Free snacks! There are blackberries along the sides of the route. When you gotta go... There are toilets along the route--six according to the map. The one we used was just a plastic portable toilet, but it was accessible & there was hand sanitizer. Stop & play. There are several parks along the greenway with playgrounds. The little park at 6th & Fir has a great newish playground as well as a fun interactive music installation. More on Street Beats here. One caveat: the greenway is still a work in progress, particularly when it comes to crossing major arterials. These intersections can be busy & a bit confusing for kids. Some have bike crossings, so you can ride through, some you need to walk through the crosswalk a half block over. Overall, it's a fun ride & still somewhat "undiscovered" by the tourists, compared to the much busier seawall. The city has created a map of the greenway--download the PDF here. For more information on the greenway, visit the city's page. 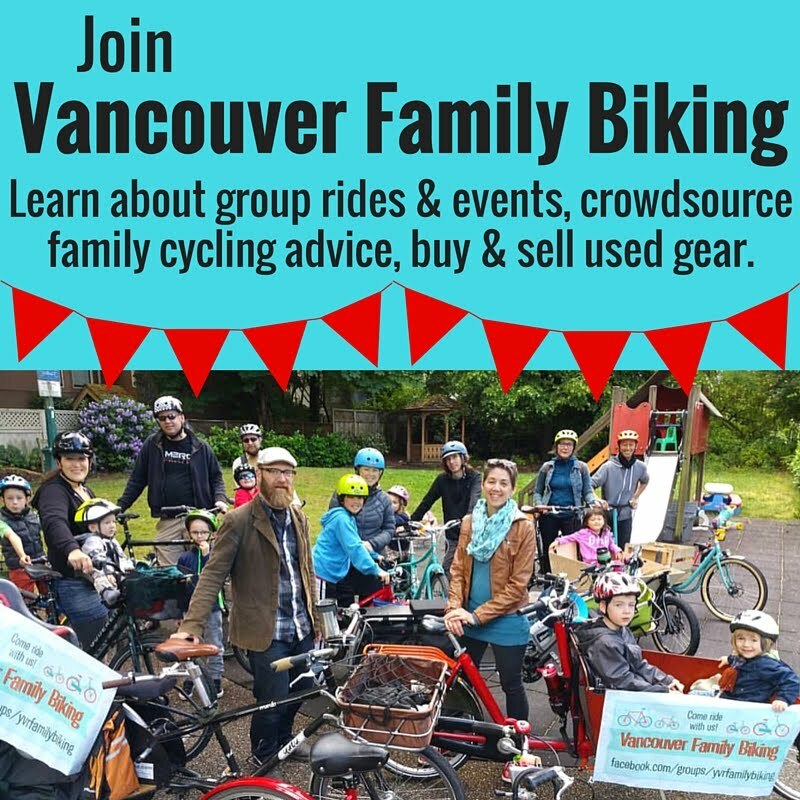 Also, check out Let's Go Biking: Colleen has a route plan for going north to south, including lots of photos & directions to get back to the Canada Line. Happy biking! If you have any other tips or feedback about riding the greenway with littles, please leave them in the comments below!